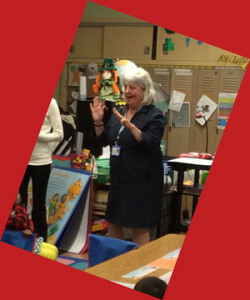 Described as the “fairy godmother of reading” by the community that loved her, Kelly Stoops rallied her whole life to develop a passion for books and reading in young children in part with her program Book Blast. Her philosophy was simple: give children books when they are young, make them excited about reading, and they’ll become lifelong learners. 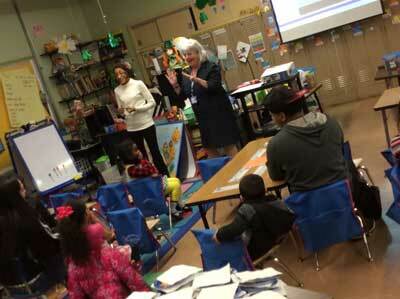 Book Blast began at Roosevelt Elementary School in Allentown, where Kelly was a teacher. During Book Blast, parents observe a trained facilitator modeling literacy strategies, which they would then practice with their child. Afterwards, snacks and crafts made the whole night an event! What strikes an observer immediately is how Book Blast involved the community. Not only were educators and children participating, but also parents, high school and college students, and even volunteers from local businesses and non-profits. 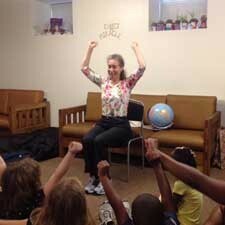 No one was unwelcome; Kelly would even visit neighborhoods to personally invite families to attend Book Blast. The blend of involvement, arts, and literacy was noted as a best practice in the Community Partners for Success (COMPASS) initiative. For a community where around 80% of households in Allentown are considered low-income, and access to books lacking, this program’s effects are huge. Reading proficiency at Roosevelt rose from 34% to 53%, and parental participation at the school significantly increased as well. 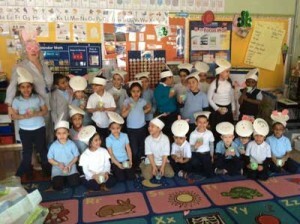 This grand success led to the adoption of Book Blast in four surrounding Allentown schools. Throughout Kelly’s 25 years as an educator, she worked day and night, both in and out of the classroom, to try to ensure that all students have a bright future. We warmly recognize Kelly Stoops as the 2016 Top Prize winner of the Freedom Through Literacy Award for her tireless effort in inspiring children to love reading. At Bacnotan National High School in La Union, Philippines, students outnumber teachers 45:1 in the classroom. Perennial floods disrupt classes. 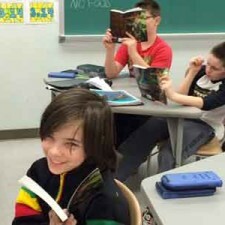 The number and quality of books at the school are often insufficient to meet the struggling readers’ needs. As a result of all this, students fail to meet reading requirements, let alone have the confidence to complete a book. This is what Maria Teresa Bautista set out to change. Her Read and Learn program pairs younger students with older Big Brothers/Big Sisters who guide them through reading, giving them a judgment-free forum within which they can improve their reading skills and their self-confidence. A love of reading soon follows after. 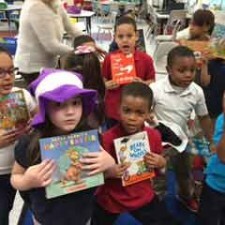 With its community-building spirit, the Read and Learn program resulted in 70-80% improvement on reading performance in its first year, with continued increases to date. 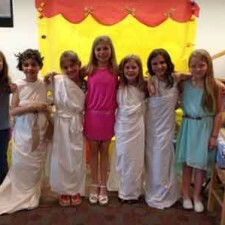 Students additionally show off their improved skills at a reading recital, sparking pride and accomplishment both within themselves and in their community. 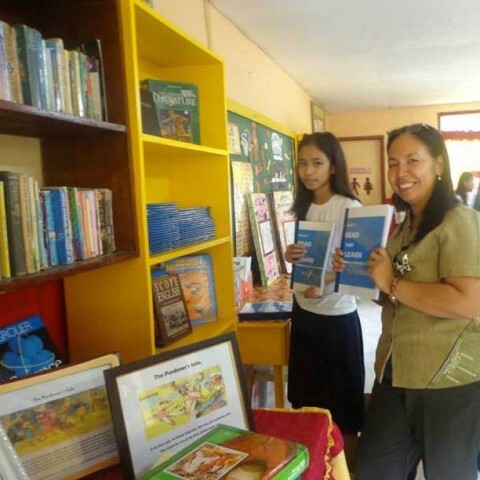 We recognize Maria Teresa Bautista as a Runner-Up in the 2016 Freedom Through Literacy Award for her efforts to build independence and confidence through the act of reading among students in the Philippines. Dawn Bush continuously promotes the special bond formed between a parent and child while reading through her Birth-to-Five Program at Casa Guadalupe in Allentown, PA. It’s the kind of bond is one that not only enriches their relationship, but it also encourages future academic success. For the families Casa Guadalupe serves, the lack of books prevents that bond from forming, as the little money they have must go to life essentials before luxury items like books can be purchased. That’s where the Birth-to-Five Program comes in. 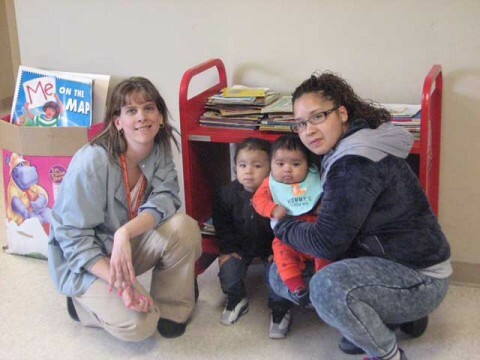 At every quarterly WIC visit, the families are given a book to take home with them, along with lessons about the benefits of reading and related tips. 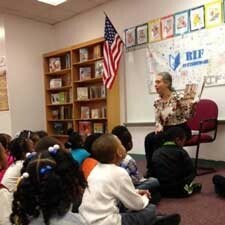 Parents additionally sign a pledge agreeing to read to their child for 20 minutes a day. 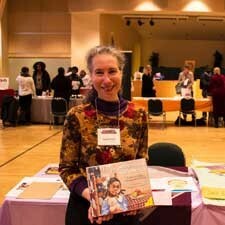 According to many of the parents, without the Birth-to-Five Program, they would not have books in their homes. Dawn says that in the beginning, children would prefer a sticker over a book during their appointments. Now it is the other way around. It is for this that we recognize her as a Runner-Up in the 2016 Freedom Through Literacy Award. 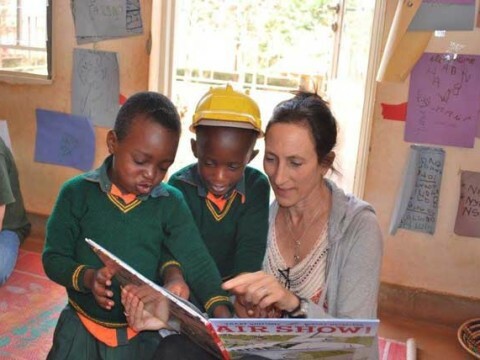 Betsy Dickey has spent the past nine years ensuring that the community in Rwinkwavu, Rwanda, has not only the proper access to information at its Library and Learning Center, but also programs that inspire literacy, creativity, and self-realization. The Library holds, among others, literacy, computer, and visual art classes, as well as music programs and storytelling opportunities. With its many partnerships and celebration of all things literacy, the Library provides a rich environment in which its visitors can not only thrive, but thrive with education. Ninety-five percent of Rwandans in Rwinkwavu are subsistence farmers, and schools lack the infrastructure and trained teachers that its students so desperately need. For a community striving to lift itself out of economic and educational poverty, the Library has become a guiding light towards doing just that. Betsy’s inspiring work in improving literacy and access to education in Rwanda leads us to recognize her as a Runner-Up in the 2016 Freedom Through Literacy Award. While Bridges of Peace and Hope has only been around for 10 years, its founder John Farrell has spent the past 25 years advocating for understanding, literacy, empathy and more. With his organization, John promotes peace and understanding across the world using media, music and stories. 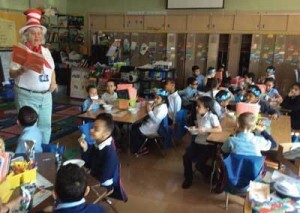 Believing that stories are “flames that light the world,” John and Bridges of Peace and Hope connect students and teachers through physical and virtual meetings in which they share their stories. More often than not, common threads are found. These stories inspire others to take initiative and either help fundraise, provide books, or simply share their own stories. 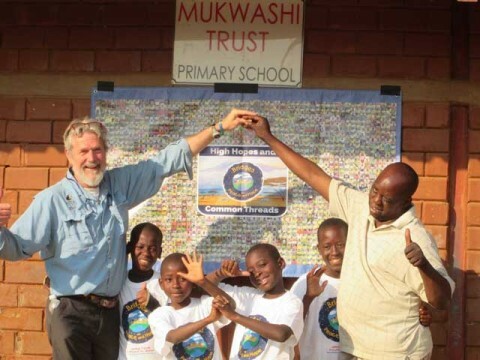 Recent fundraising efforts have lead to the construction of classrooms for the Mukwashi School in Zambia. We recognize John Farrell as a Runner-Up in the 2016 Freedom Through Literacy Award for his creative and enriching non-profit that continues to grow a community of globally-aware and book-loving advocates for peace. Whereas students in Cambodia normally sit in classrooms focused on rote memorization of facts, Sue Guiney’s Writing Through program engages the students in a literacy-rich environment where ideas are posed and challenged. Students start to realize the power of imagination, and the power of stories. Though a young organization (it was created in 2014), Writing Through blazes an inspiring trail for students to learn how to express themselves in English. Using a collaborative method between instructors and students, Writing Through holds workshops that expand English fluency and promote creativity. By building confidence through a supportive and imaginative space, Writing Through allows students to gain self-confidence and literacy skills that aim for success. 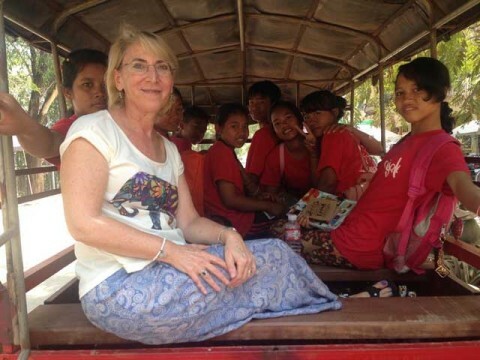 Sue Guiney is recognized as a Runner-Up in the 2016 Freedom Through Literacy Award for her illuminating use of poetry and stories to encourage English literacy among students in Cambodia. 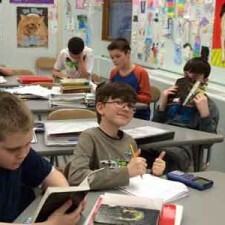 Heidi Abi Nader could be described as one of those teachers who goes above and beyond for her students, and nowhere is this more apparent than her project Sharpsville Middle School Reads. When the idea of bringing author Elio Schrefer floated around the halls of Sharpsville Middle School, Heidi caught it and ran. Her program allowed for every student to own a copy of Schrefer’s book Endangered, while Heidi organized weekly contests, daily quizzes, and discussions to engage the entire school with the book for six weeks until the author himself arrived to give presentations. 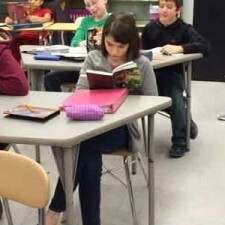 Her commitment to literacy is sure to become a legacy at Sharpsville. 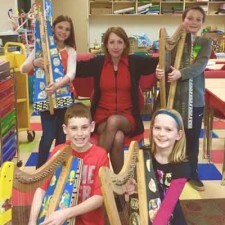 It might seems strange to think that building a harp and developing literacy would be connected but Julia Dweck’s Musical Mythology project does just that. 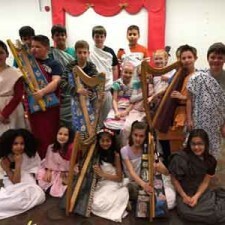 With the help of the Fireside harp kit, Dweck’s students read and discuss Greek mythology and The Lightning Thief, choose a god upon they base an ode, and culminate their knowledge and creativity in a performance using the harp they built together as a class. Believing that books activate senses beyond the visual, Julia invites students to experience their tactile and audio aspects to inspire a love of reading. Helen Ferguson’s We Care, We Share, Books for Foose donates 4,000 books each year to classrooms at Foose Elementary School in Harrisburg. Helen and other volunteers visit 26 different classrooms 5 times a year, bringing a Santa-like bag of books for the students, and explain to them how a book is made and, of course read out load with enthusiasm and energy. 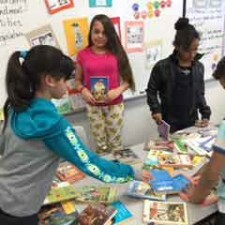 Students then get to select their very own book from the bag to bring home. 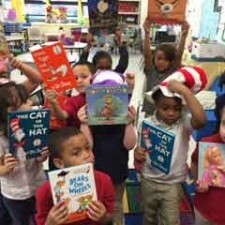 For a school whose students rarely have he means to go to the public library and whose own library’s funds were significantly cut, the We Care, We Share program really does feel like Christmas. On Wednesday May 4th we gathered together to celebrate Judith’s Reading Room 2016 Freedom Through Literacy Awards Winners. We would like to the share this wonderfully produced video shown at the 2016 Freedom Through Literacy Award dinner in honor of Kelly Stoop’s GRAND PRIZE Award initiative “Book Blast”. More information on Kelly Stoops, “Book Blast” and the winners will be coming soon!